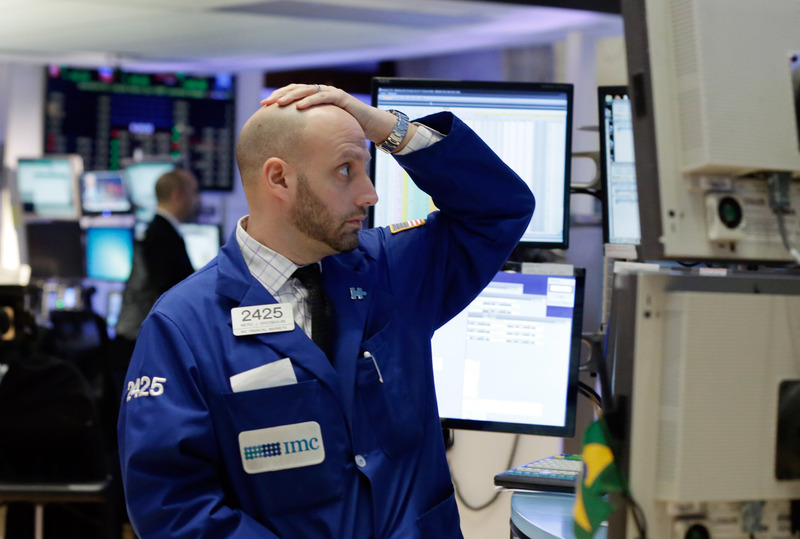 Shares on Wall Street tumbled Monday, following sharp losses in China and Europe. U.S. stocks started 2016 with their biggest intra-day selloff since September 2015. The Dow dropped 423 points, or 2.4 percent, to 17,002 at 12:25 p.m. Eastern. The S&P 500 shed 2.3 percent, or 48 points, to 1,995 and the Nasdaq fell 2.8 percent, or 141 points, to 4,866. Overnight, Chinese markets dropped nearly seven percent, and so-called circuit breakers halted trading. European markets were also down significantly as investors saw signs that China's slowdown could continue well into 2016. The Shanghai Composite Index dived 6.9 percent to 3,296.66, its lowest level in nearly three months. The drop led the Shanghai and Shenzhen stock markets to halt trading for the remainder of Monday to avert steeper falls, the official Xinhua News Agency said. It was the first time China used the "circuit breaker" mechanism it announced late last year. Chinese authorities have been trying for months to restore confidence in the country's stocks after a plunge in prices in June rattled global markets and prompted a panicked, multibillion-dollar government intervention. Beijing is gradually unwinding emergency controls that included a freeze on new stock offerings. Concerns about China's economic slowdown were revived by weak manufacturing data released Monday, along with Middle East tensions, which pushed up oil prices. Huang Cengdong, an analyst for Sinolink Securities in Shanghai, said selling accelerated as investors tried to lock in trades before activity was halted. The Caixin/Markit index of Chinese manufacturing, which is based on a survey of factory purchasing managers, fell to 48.2 points in December from 48.6 the previous month, marking contraction for the 10th straight month. It was the latest sign of the headwinds facing China's economy that add to a downbeat outlook for Asian exporters. On Friday, an official manufacturing index also showed a persistent contraction in factory activity despite Beijing's stimulus measures. China's factory data is "still a long way off stirring up cheer about global demand recovery," said Mizuho Bank Ltd. in a daily commentary. "Asian exporters are expected to continue struggling with exports contraction and growth prospects dampened by related manufacturing gloom." Meanwhile, escalating tensions in the Middle East pushed up the price of oil, analysts said. Saudi Arabia said Sunday it is severing diplomatic relations with Iran, a development that could potentially threaten oil supply. The world's largest oil supplier executed a prominent Shiite cleric that prompted protesters to set fire to the Saudi Embassy in Tehran and Iran's top leader to criticize Saudi Arabia. "Oil markets will be concerned that this could be an incremental step in a deteriorating political situation that might ultimately threaten world oil supply," Ric Spooner, chief analyst at CMC Markets, said in a commentary.